The Symmetrization Postulate of Quantum Mechanics in NMR Spectra (S. Szyma&nacute;ski, P. Bernatowicz). Chemometric Analysis of NMR Spectroscopy Data: A Review (T.M. Alam, M.K. Alam). Multiple-Quantum Magic-Angle Spinning:High-Resolution Solid-State NMR of Half-IntegerSpin Quadrupolar Nuclei (Amir Goldbourt, P.K. Madhu). 73Ge NMR Spectroscopy of Organogermanium Compounds (Yoshito Takeuchi). NMR Studies of Purines (R. Marek, V. Sklenár). Numerical Simulations in Biological Solid-State NMR Spectroscopy (A.C. Sivertsen et al.). Nuclear magnetic resonance (NMR) is an analytical tool used by chemists and physicists to study the structure and dynamics of molecules. In recent years, no other technique has grown to such importance as NMR spectroscopy. It is used in all branches of science where precise structural determination is required and where the nature of interactions and reactions in solution is being studied. 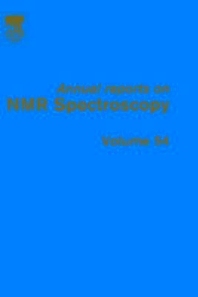 Annual Reports on NMR has established itself as a premier means for the specialist and nonspecialist alike to become familiar with new techniques and applications of NMR spectroscopy. Organic, inorganic, analytical and physical chemists, biochemists, structural biologists, physicists and all those studying and using NMR spectroscopy.